Crafted by the world-renown Grandma Smith, this dark red toupee frames your face nicely and is imbued with magical energy that allows you to move with grace. 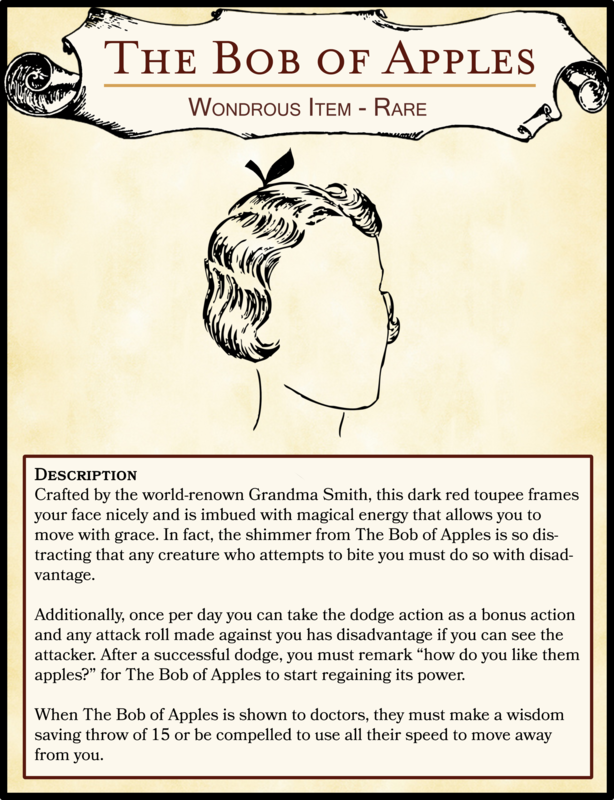 In fact, the shimmer from The Bob of Apples is so distracting that any creature who attempts to bite you must do so with disadvantage. Additionally, once per day you can take the dodge action as a bonus action and any attack roll made against you has disadvantage if you can see the attacker. After a successful dodge, you must remark “how do you like them apples?” for The Bob of Apples to start regaining its power. When The Bob of Apples is shown to doctors, they must make a wisdom saving throw of 15 or be compelled to use all their speed to move away from you.